Tottenham Hotspur are expected to be without both Dele Alli and Hugo Lloris for this weekend's Premier League showdown against Liverpool. 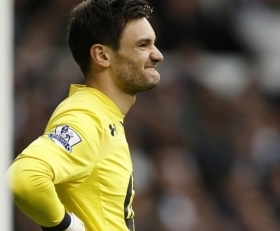 Tottenham Hotspur manager Mauricio Pochettino reportedly has no plans to exclude goalkeeper Hugo Lloris from his weekend's Premier League meeting against Liverpool. Tottenham Hotspur have reportedly received an injury boost with club-captain and goalkeeper Hugo Lloris likely to be fit for this weekend's Premier League game against Liverpool. Tottenham Hotspur striker Harry Kane has said that his side's win over Manchester United is massive. Champions League holders Real Madrid are interested in signing France and Tottenham Hotspur goalkeeper Hugo Lloris, according to The Sun. Inter Milan midfielder Ivan Perisic has said he will go on his post-World Cup rest and return to focus on his current club amid links to Manchester United. France goalkeeper Hugo Lloris has said that he expects midfielder Paul Pogba to show his talent as the World Cup advances. Tottenham Hotspur are reportedly plotting an approach to sign Manchester United goalkeeper Sam Johnstone during the summer. The 25-year-old's contract is due to expire at the end of the season, though the Red Devils have the option of a 12-month extension clause. With the World Cup on the horizon, we analyse whether or not Lingard could be preferred to Dele Alli for England's attacking midfield. Tottenham Hotspur will meet Juventus for the first time in a competitive fixture when they travel to Turin for the Champions League round of 16 first-leg. Spurs come off a solid 1-0 win over Arsenal in the Premier League, but they are up against an outfit which have kept seven consecutive clean sheets across all competitions. Tottenham Hotspur will look to avenge their early season defeat to Arsenal when they host them at the Wembley Stadium tomorrow. Spurs have dominated the proceedings versus their north London rivals in their home patch, but they will still be wary of the Gunners' newly-formed attack partnership of Henrikh Mkhitaryan and Pierre-Emerick Aubameyang. Real Madrid are reportedly planning to revive their interest in Tottenham Hotspur's Hugo Lloris at the end of the season. The France international has previously attracted interest from the European champions, but a deal has never materialised. Arsenal boss Arsene Wenger has picked Alexandre Lacazette from the off for north London derby versus Tottenham Hotspur this afternoon. The France international bagged a brace in the international friendly versus Germany, and he has earned his spot with the blossoming form. For a side that entered the season with league title hopes, the 2017-18 campaign has not been particularly friendly to Jurgen Klopp’s Liverpool thus far. It's been a difficult start. Kane scored yet another hat-trick to fire Spurs past APOEL in the Champions League and his goalscoring record is now comparable to the likes of Cristiano Ronaldo and Lionel Messi. Antonio Conte put in a tactical masterclass as Chelsea were able to come up 2-1 winners against Tottenham, who were clear favourites in the lead up to the game. Anyone who follows Spurs knows that they are in desperate need for a backup striker to fill Harry Kane's boots. If last season they had a player that was up to the standard required to play in the EPL, they may well have snatched the title from Chelsea. They lost too many points when the England and Golden Boot winner was out injured which ended up costing them vital points. Tottenham Hotspur are willing to offer a 200 percent wage rise to defender Toby Alderweireld in an attempt to prolong his stay in north London.